Blood tests can only be sanctioned by a member of our clinical team (doctor, nurse, midwife), or a hospital practitioner. For blood sampling, please book an appointment with our Phlebotomist. Blood test appointments are available in the morning and early afternoon to allow time for the samples to reach the lab the same day. Please bring your blood request form if you have one. 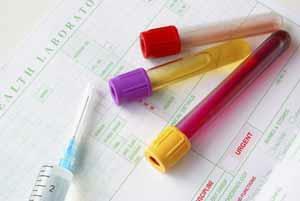 Appointments for blood tests may be booked up to 4 weeks ahead. Please bring urine specimens in before 12:30pm on the same day that they are produced. Please make sure specimens are labelled with the date and your name and Date of Birth. You may have been given a form to hand in as well. The sample must be mid-stream. This means that either you start to pee, then stop, start again and collect the second void, or you pass the bottle into the stream of urine when you are about half-way through voiding. In this latter case, please rinse the outside of the bottle afterwards, having secured the top tightly! This will usually be a red-top container, which contains acid to prevent overgrowth of bacteria. Please fill it near to the top, as otherwise the concentration of the acid preservative will be too strong. Whenever possible the sample should be passed on the same morning it is brought for testing, and is best passed directly into the bottle rather than decanted from another receptacle. Label it with your name, date of birth and the date. If you have a form, please enter the date and time the sample was collected in the appropriate place. Please note that the laboratory does not undertake routine pregnancy testing. Fast reliable tests can be purchased at the chemist. Getting a Result – SMS texting can make it more efficient, read on! Results of urine and blood tests usually take 5 working days to come back from the laboratory. X-rays and Ultrasound reports often take up to 2 weeks after the investigation. If you have had a radiology investigation (CT, MRI, Barium enema/swallow, Ultrasound etc) which was requested by a hospital doctor, we are unlikely to receive the result, which will go instead to the hospital doctor; so you will need to wait for your follow up appointment at the hospital, or sometimes they will write to you directly. Please phone reception (after midday) after at least 5 working days to receive your result. We will try to contact you if action is required (SMS is very effective here), but if you have not heard after 5 working days, please phone reception. When you phone for results please make it after midday. The receptionist will be able to tell you if any further action is required but is not qualified to discuss the result with you. Should this be necessary, please make an appointment to speak with the doctor who requested the test. If we have a current mobile phone number for you and you have consented to us contacting you by SMS text we can inform you of results requiring action by text. This is a very quick & efficient way to keep you informed. If you have not already given us your consent to contact you by text or you have changed your mobile phone number then please contact reception to update your details. No clinical details will be included in an SMS text message.